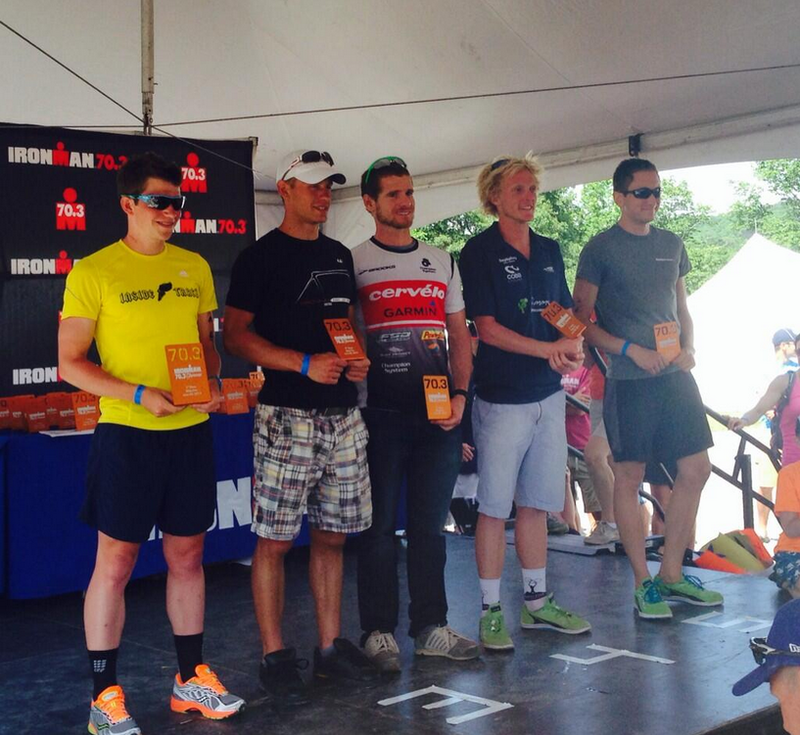 I’m pleased with a well-executed race at Syracuse 70.3 to again finish top 5 at my third IRONMAN 70.3. I’m encouraged by my balanced performance across the three disciplines and the consistency I’m achieving in my first pro season. The past couple months have seen major changes in my training and a fundamental shift in my thinking. I once prided myself in being a lone wolf, believing that I could be a self-taught expert in all things triathlon and self-coach my way to the highest level of the sport. It wasn’t hard to avoid challenging this naive belief because I was steadily improving and finding some success. I was fortunate to cross paths with a few people who recognized my potential and opened my mind; first Richard Pady of Healthy Results, then Tim Floyd of Magnolia Masters and most recently David Tilbury-Davis of PhysFarm, among other influences. With their help, I gradually came to realize that triathlon may be an individual sport, but pursuing high performance is very much a team effort with many players. I’m now coached by David and Tim and I continue to benefit from Richard’s mentoring. I’m also bringing in experts to help me perfect every element of my craft, from a sports doctor to a dietitian to a communications consultant. My only regret is that this realization didn’t come sooner. Onward! A big personal best swim came as a surprise. Coach Tim put my swimming on the back burner after Texas 70.3 to allow me to adjust to changes in my run and bike training. Since then, I’ve swum only 13-15,000m over 5-6 short swims per week, but we were able to make very efficient use of that time. Something clicked and I began swimming very well the week leading into the race. I’m obsessive about my bike setup and have started applying the same scrutiny to all my equipment. After testing no fewer than 8 goggles, I settled on the Vorgee Missile. Goggles are one of the most overlooked, best bang-for-your-buck upgrades. For years, I made do with uncomfortable, foggy, leaky goggles without realizing the impact they had on my sighting and “situation awareness” during the chaos of the swim. It’s also telling that my first swim in the new Nineteen Rogue was a personal best. I fought hard for feet at the start and drafted until the pace settled down. As expected, a small pack including super-swimmers Collins and Seear broke away and I found myself leading a chase pack, feeling calm and in control. After a botched swim exit, I came out of the water right behind Rapp, Ambrose and Holtham less than 1.5 minutes down on the small front pack. I was eager to repeat the breakthrough ride I had at Texas 70.3. The Syracuse 70.3 course features one long climb and many other significant hills. On a course like this, pacing well is as difficult as it is critical. Obviously it’s impractical to precisely stick to a pacing plan given the unpredictable nature of racing, especially in the pro race where tactics come into play. It’s also tricky to memorize a long list of intervals (although it is possible to program them into a Garmin computer). I focus on memorizing my target power only for critical sections of the course, like the big climb. 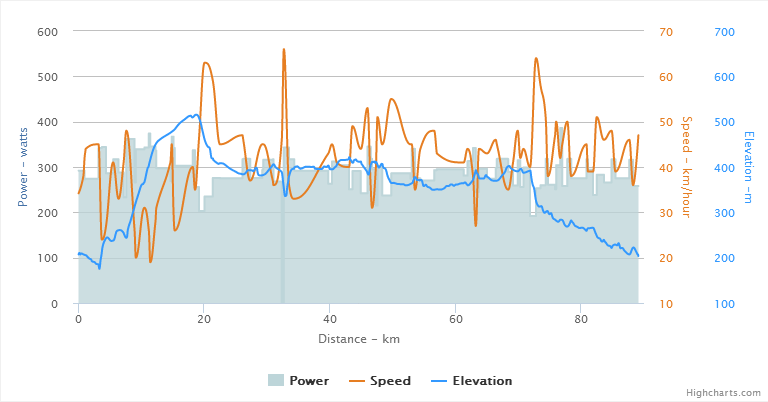 I also get a sense of what power I should aim for on flat sections with headwinds/tailwinds/crosswinds and minor/medium/major hills. I paced the ride well and finished only a couple percent below my target power. Here are the numbers and the file on Strava. I weighed about 154 lbs (~70kg) before the race. I rode with Paul Ambrose, leading and pushing the pace most of the time. The ride was mostly uneventful, apart from launching a bottle of my homemade sports drink only 2 km in. I struggled to pick up enough on-course nutrition, reinforcing the importance of building flexibility and redundancy into your fueling plan. Like Texas 70.3, I again found myself starting the run hungry and thirsty. I couldn’t agree more with Rappstar. The course is a two lap out-and-back with a monster climb just before the turnaround. Some loose gravel, grass and sun conspired with the twin peaks to squeeze out every last drop of suffering. Out on the run, I quickly gapped Ambrose and began reeling in Rapp who was about two minutes ahead. I was feeling ok until I rounded a bend and saw the climb. Its nastiness caught me by surprise, like a fish slap to the face. That’s when I remembered the keyword Coach David gave me for banishing the negativity that inevitably creeps into your mind during a long race: Unbreakable. It reminded me that I’ve never cracked in a race. Not once. A geological era passed and I found myself at the top of the climb. I surveyed the damage. Somehow, I had actually made up ground on Rapp and the other athletes I could see on the climb looked as miserable as I had been. Suddenly things were looking up! I was positive and focused for the rest of the run. Passing Rapp on the second lap was surreal, since I have followed and admired his exploits long before I had any notion of going pro myself. I briefly ran in 3rd place, but was overtaken first by Ben Collins and then by a hard-charging Lionel Sanders, who is establishing himself as the most dominant runner in 70.3 racing. I didn’t let this phase me and kept clipping along. Seeing that my position was established, I allowed myself the pleasure of cruising the final mile, giving some high fives and riding the high of another successful race. Congrats to my teammates on the MultiSport Canada Recharge With Milk Ambassador Team who also raced well: Lionel Sanders, Alexander VanderLinden and Mikael Staer Nathan. Next up is Challenge St. Andrews on July 6th, a new half distance triathlon in New Brunswick. A $30,000 prize purse will no doubt attract another killer field.